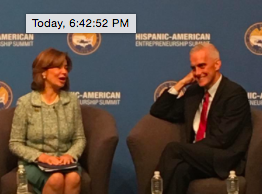 Last week, I had the honor of attending the Small Business Administration’s Hispanic-American Entrepreneurship Summit in Washington, D.C.
SBA Administrator Maria Contreras-Sweet led and hosted the event. Speakers included a number of Cabinet-level officials, including White House Chief of Staff Denis McDonough. Organized by SBA Administrator Maria Contreras-Sweet and her office, the day-long Summit featured speakers at the highest levels in government, with the U.S. Secretaries of Commerce, Labor, Education, Agriculture and the Interior as well as the White House Chief of Staff, Chairman of the Council of Economic Advisors and U.S. Trade Representative on hand to discuss the important role Latinos play in American business.The event brought together some 150 invited business leaders from across the country and various industries. The conversations were really engaging, but what I found to be the biggest takeaway from the event how much it reinforced what I believe every day when I go to work at 7 Generation Games. There is no better time or place to be starting a business than in the United States right now. This comment was made by several speakers. The amount of resources and opportunities that we have available to us are incredible when compared to the rest of the world. That doesn’t mean there aren’t still challenges and obstacles. That doesn’t mean it’s easy or that money is just being thrown around. But we are incredibly lucky, especially as a tech company, to be based in a country that is leading the way when it comes to innovative technology. Many people still do not understand the power of the Hispanic (and other underserved minority) communities. They will. In our very early days, I had an investor (not in our company) tell me that what we were doing was niche because our games had Native American storylines, even though I said they weren’t just for Native Americans students to play. Later, I was told that it was nice that we wanted to serve communities underserved by most other educational software companies, but what about “the other (i.e. richer) schools.” The idea that we couldn’t create a software product that could meet the needs of all students. And again, when we created a game that could be played in English or an English-Spanish bilingual setting, we were asked about the concerns that it would be seen as only a bilingual product, therefore only for Hispanic students because it had a bilingual option. That mindset – that it can only be for “them” and not all students because of the storyline or characters – fails to take into account that games or books or any matter of learning materials featuring white students have for generations been used in the classroom setting and no one seemed to question how they could be relatable to all students. The demographics of this nation are shifting, and the power, especially of the Hispanic consumer, is not going unnoticed. There is still work that needs to be done when it comes when it to access to capital for minorities. Hopefully, the more attention that is brought to this problem, the greater effort there will be to ACTUALLY change it. The fact that less than 1% of VC investment is in people of color is jaw-dropping when compared to the population breakdown. Being in a room with so many Latino entrepreneurs truly hit home that message. This is not a problem that will disappear overnight, but I think the more the issue is raised, the harder it becomes to ignore. 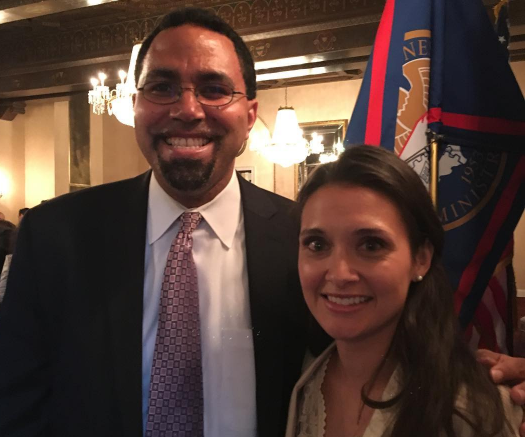 One of the many highlights of the Summit was meeting Secretary of Education John King and telling him about our games. There are many people in the government who are working to do great things for both Latinos and small businesses. Too often, government is discussed like restaurants on Yelp! That is, when something is bad, we’re very vocal about our displeasure, but when it’s good we are simply content and go about our way. But I had the opportunity to tell Secretary of Education John King about the games we make. In both my brief conversation with him and his remarks to the Summit attendees, he clearly understands both the power of technology when it comes to education and the need for that technology to be created to meet the needs of and be reflective of all students, including minority and rural communities. I had the chance to personally thank Secretary of Agriculture Tom Vilsack for the support that USDA has given us. We would not be where we are as a company without the SBIR funding we received from his office. And Administrator Contreras-Sweet is inspirational as both an incredibly successful Hispanic businesswoman and in her position at the helm of the SBA. Strive for big things. So often, we, especially minorities and women, are met with skepticism and negativity when we look to launch businesses with an aim of emerging as industry leaders. There is the often unspoken (although sometimes said aloud) “What on earth makes you think you can accomplish that?” The most powerful words that I left the summit with were the closing remarks, where Administrator Contreras-Sweet said passionately that at the SBA “We want to see you become big businesses.” That their end goal for businesses that have the desire and ability to scale is to see them the outgrow the SBA, to no longer need her agency. At 7 Generation Games, we have sought out to accomplish big goals since the day we were founded – and we plan to do just that. Want to help us become a big company? Buy our games! Thank you for the share! Love the photos!